Podranea ricasoliana, the pink trumpet vine, has been out of fashion in Australian gardens for a long time, for no particular reason seeing it is a very attractive plant. As well as pink trumpet vine, this showy plant is also commonly known as Port St. John creeper, after its place of origin in South Africa. Its genus name Podranea is an anagram of Pandorea, the genus name for a group of closely related Australian native vines all in the Bignoniaceae family. It is a vigorous, evergreen scrambler with glossy compound leaves. 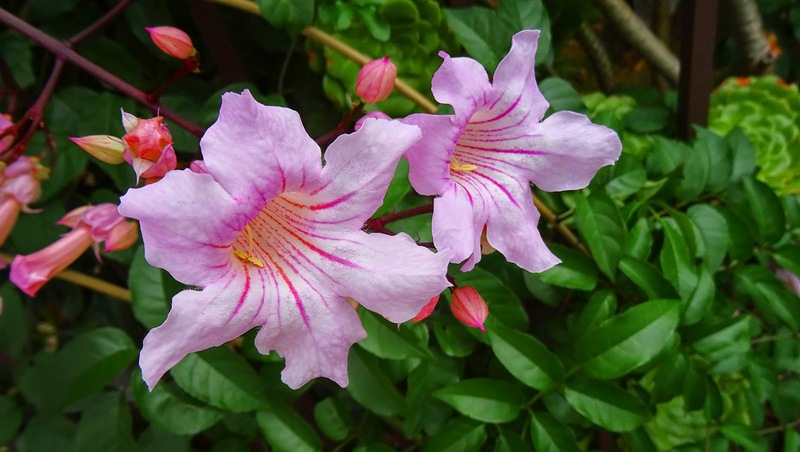 The beautiful trumpet shaped flowers are pale pink with carmine stripes and yellowish shading in the throat. Flowering time is summer and autumn. The fruit is a bean-like capsule containing winged seeds. Pink trumpet vine will grow best in the warmer parts of Australia, and is well worth a try in inland areas. It has low water needs once established. It looks good grown over fences or walls pruned into a shrub or weeping standard. Pink trumpet vine grows best in a sunny position, but will tolerate light shade. It needs a well drained soil and a strong support if it is to be grown as a climber. Water well until the plant becomes established. Prune to shape and control growth immediately after flowering. It is high maintenance if pruned as a shrub or standard. The reward is a lovely plant with hardy attractive flowers, very free flowering, virtually pest and disease free and drought resistant. Gorgeous flowers ! I love that color ! Is that a Gazania you have as your icon? I like the darker veins on this flower! Lovely flowers. Thank you for hosting! Terrific plant and what a great photo. The shape of the flower reminds me a little of some of the frillier streptocarpus plants. Lovely plant....thanks for hosting as I love flowers. I learn a lot here also. Such a stunning color, Nick! I love these blossoms, so nice in color and details! Really pretty flowers, Nick. Beautifully photographed too. :) Happy weekend to you. Always something new! Wish I could grow this at my house in Seattle. So pretty. My trumpet vine is a transplant from my mother's property and is the standard orange color. I would love to have one this beautiful. Flores maravilhosas!!! Não conhecia essa flor. What a beauty. Gorgeous! Have a good week! Your trumpet vine is lovely and so beautifully photographed! Thank you for sharing and hosting! Delightful shot of a magnificent bloom!